We have been notebooking in our homeschool for as long as I can remember. Notebooking allows my children to have a scrapbook of their learning. It allows them to express themselves through writing, drawing, cutting and pasting, and more. 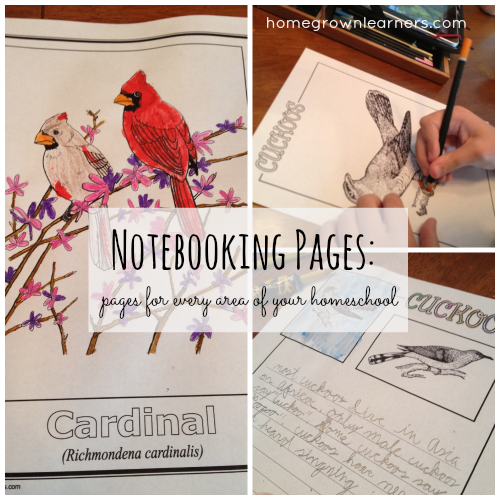 Notebooking can also be done across ALL areas of your homeschool. We have notebooked our way through history, science, and music - with sprinklings of Bible copywork, math notebooking, and notebooking with literature. My FAVORITE resource in this area is Notebooking Pages. Don't you love the image above? We have been notebooking all about birds for the past couple weeks. With my Notebooking Pages Lifetime Membership I have complete access to HUNDREDS of notebooking pages. This Birds Set includes 55 notebooking pages with primary and regular lines in a variety of layouts. Notebooking Publisher Web App - This is an area of the site where you can create your OWN notebooing pages. 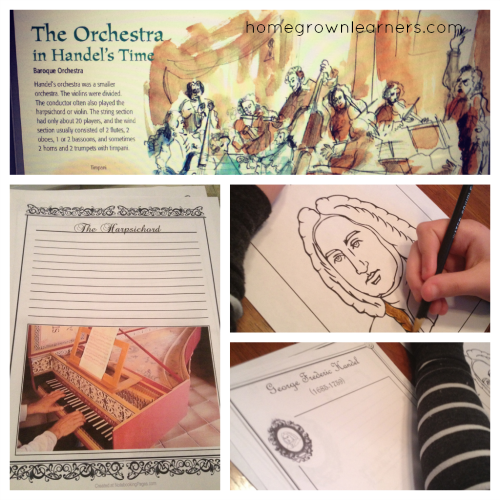 In the photo below I created a notebooking page for the harpsichord while we were learning about Handel. I simply typed in "Harpsichord" and found a picture of one online and added it. It was EASY! My daughter is enjoying creating notebooking pages, too. The possibilities here are endless. Members receive one free year access to this notebooking web-app. The Notebooking Shop - Here you can purchase individual products and product bundles. 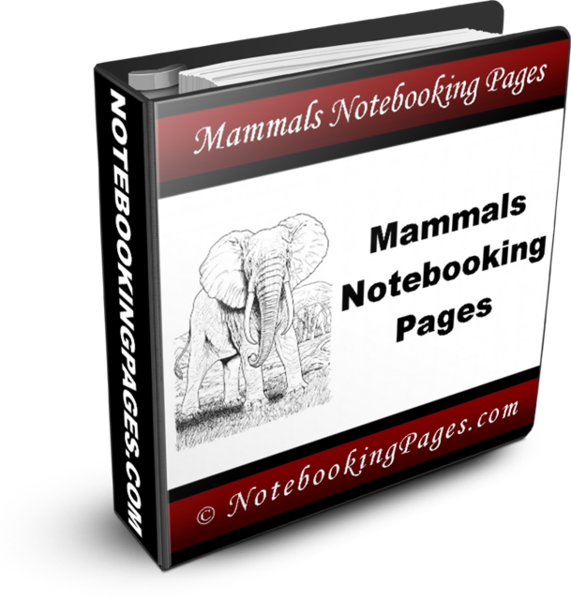 For example, you can purchase a set of notebooking pages for mammals for $5.95. Or, you can purchase Latin & Greek Word Study Pages for $2.00. There are SO MANY OPTIONS. These are just two of the sets we have enjoyed using. There are many, many more! The website itself is very easy to use. When I log into my account, I simply go to "member download area" and can browse all of the notebooking pages. I then click on exactly what I want and the pages are downloaded in a .pdf file to my computer. Super simple. Using the Publisher App I can create pages for anything I want - literally. In the picture below we were working in Story of the World. I wanted to created a page showing Peru. I could grab a premade page of South America from the site, and then add the text "Secret of the Andes" and the arrow to the map. We put this in our notebooks. I also wanted to make a sheet about llamas. Using one of the many templates in the Publisher App I created one in just a few minutes. Added to the notebook was also a Middle Ages notebooking page (which is part of a set offered on the site). I created a completely customized notebooking set for one specific chapter in our history text. I love that one of the new features in the Web App is custom copywork pages. Notebooking Pages has put together a nice video about this feature. Watch how easy it is to make a beautiful page of copywork. Notebooking Pages is my one-stop shop for notebooking. It is a resource we use DAILY. No more hunting for notebooking pages all over the internet. It is all in ONE PLACE. I love that. *I was given a membership to Notebooking Pages in exchange for this review. I have, however, been a LONG time user and fan of notebooking pages (as evidenced by so many of my blog posts!). The opinions in this review are mine and I was compensated for my time. This post also contains affiliate links.